A selection of hand-rolled incense sticks made in India by impressions incense, supplied in hexagonal packets that come in a variety of over 21 popular and well known fragrances that have a long burn time of around 45 minutes. 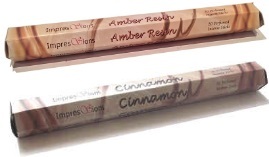 Impressions Incense sticks uk are sold and supplied in packs of 20 incense sticks that are 24cm long. Simply light an impressions emporium incense stick and put into your incese holder and sit back and enjoy these quality incense sticks with well defined and quality aromas. Made with a good selection of differant fragrances and oils and are also hand rolled on a natural bamboo stick. Please take a look at our other incense sticks.